I can hardly believe there are so few days left in November! 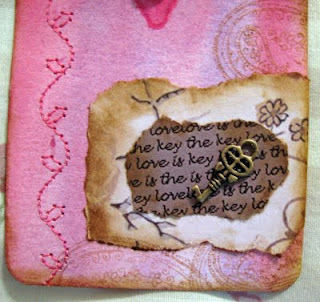 I was looking through the latest issue of Cloth Paper Scissors and saw beautiful tags. I got my basic idea from that article. I found these great charms from Explorer and the fibers are from basic grey. 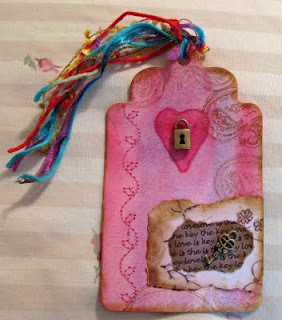 I watercolored my background and stitched onto the tag, stamped with a paisley stamp from stampabilities, and went around the edges of everything with ranger distress ink (vintage photo). I made my text on photoshop elements and the paper under the text was a clipart from dover. Have a great weekend. Keys are amazing, they are so full of symbolism and meaning. I like this piece. Love is, indeed the key. I love how you took these elements, separate, and made a whole out of them from love. *Sigh* makes my heart sing. Wonderful. I love how you put it all together. I also think your watercolors I saw down the page were beautiful. Thank you for sharing. all the elements and colors work so well together ...i love visiting to see what is next!! i love keys and what a great idea!